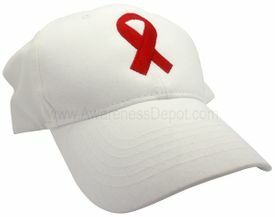 This AIDS Awareness Ribbon Hat features beautifully embroidered red ribbon to show your support for those living with HIV/AIDS. The cap is made from all cotton, and is a soft, flexible white cap with an adjustable strap. One size fits all.